Following up on his remarkable TRIANGULAR TRADE, sound artist (and operator of the Every Contact Leaves a Trace imprint) Seth Cooke offers with Double B another richly investigated, purposeful work looking into the sonic artifacts of the unresolved dissonances in constellations of history, politics, and media. Through his no-input field recording technique, Cooke brings into consideration the materiality of the inscription devices, a sort of sonic ghost hunting that rewards investigative listening. Like the work of Akomfrah or Sebald, Double B traces a path through seemingly disparate places, times, and ways of listening. Don Drumm’s sculpture caught a stray shot on 4th May 1970. Sunlight strikes the bullet hole, constellations repeat as history revolves relative to a fixed point. Jo Cox was shot and stabbed on 16th June 2016, a week later we cracked apart along every fault. An attic hideout, a project space, a woodshed, a field in England. Darren Osborne intended to kill Jeremy Corbyn and Sadiq Khan. In court he claimed his fictitious friend ‘Dave’ drove the hire van into the worshippers outside the Finsbury Park Mosque, another absent agitator. 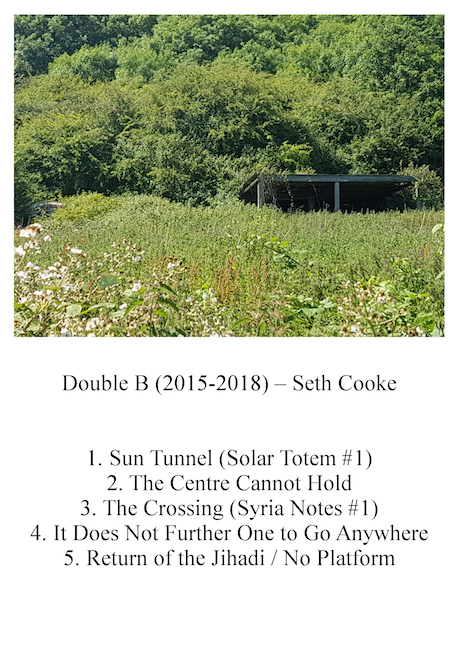 Double B is five tracks of one-take pseudo-performative no-input field recording/field recording, upon which compression was piled until the structure broke under the weight. Imprints, feedback, pitfalls and backmasking layered later. In an edition of 40 with original photographs and text by Cooke.